Passionate advocates for early learning for more than two decades, Dave and Debbie Walker have made a $1 Million donation to United Way Suncoast for community children — and hope to inspire others to do the same. 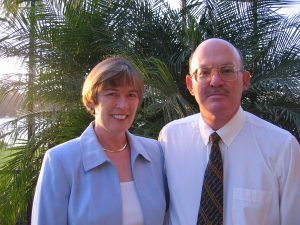 Dave Walker and his wife Debbie retired to the Tampa Bay area more than a decade ago, following a successful career with Procter & Gamble in Cincinnati. Dave has been a United Way donor and volunteer for decades. Over the last three decades, Dave has served on the Board for Every Child Succeeds, United Way of Greater Cincinnati, United Way of Pasco County and United Way Suncoast. The gift is motivated by the Walkers’ desire to help others and break the cycle of poverty in the communities they call home. “Debbie and I have been fortunate, but we know that not everyone has the same access to education and opportunities we had. We want to do our part to change that and sought United Way’s help to make our aspiration a reality,” said Walker. Walker shared that he and his wife grew up in blue collar families in rural communities. Neither of their grandparents finished high school but each successive generation has done better due to their strong work ethic and greater access to education. It was important to the Walkers to pay it forward for future generations. The Walkers see early education as critical to breaking the cycle of generational poverty. Their donation will sustain and nurture the proven foundations of United Way Suncoast’s early learning regional community impact work and launch new, research-based programs and initiatives to expand and improve performance across the community.